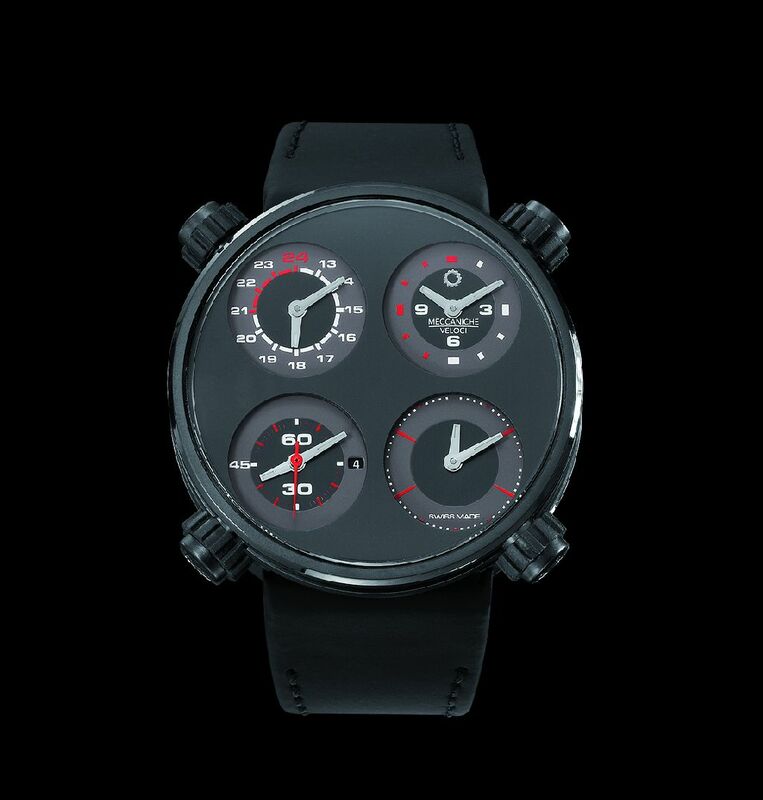 Italian luxury watch brand Meccaniche Veloci enhances its Quattro Valvole line with a new design, the Quattro Valvole 48 Quattro Tempi, a high calibre watch dedicated for the motor enthusiasts. This new addition maintains the core aesthetic values that have always distinguished this model. The innovative use of materials and the evolution in design is illustrated in this bold and striking timepiece. In this latest watch Meccaniche Veloci has combined its distinctive design, motorsports technology and Swiss watch making expertise to create a dynamic addition to its sophisticated collection. Originally launched in 2006, the Quattro Valvole was an instant success; this was owed to its stylistic creativity and the use of materials inspired by the world of motor sports. This success continued in 2009, when Meccaniche Veloci embarked upon a new innovation in materials through an association with Brembo, a global leader in the production of braking systems. Together they developed the use and processing of carbon ceramics and the result was a revolutionary watch: the Quattro Valvole CCM. 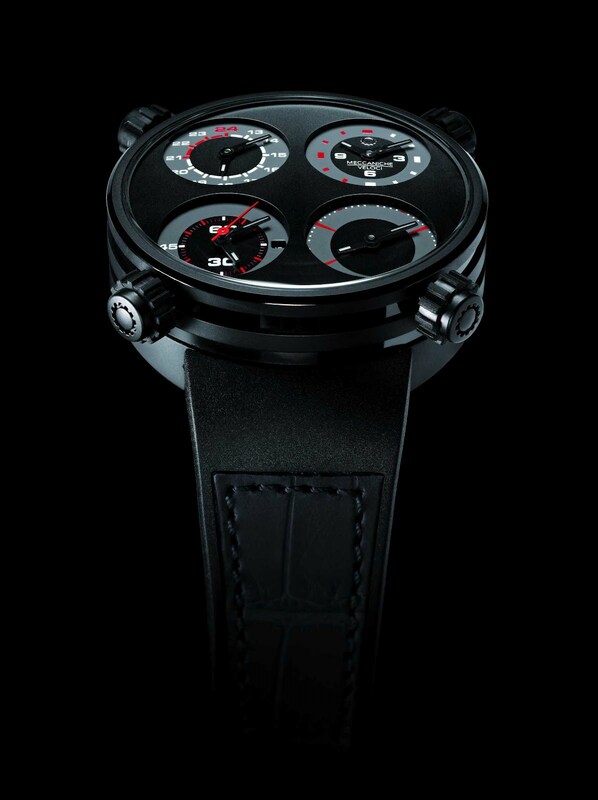 Following this success, the brand focused on watch manufacturing technology and quality. This emphasis placed upon research and development has continued and this new collection sees attention being given to movements and the true functionality of the watches, all distinguished by the Swiss Made hallmark. The Quattro Valvole 48 Four Strokes introduces a revolutionary new development: a single dial housing four movements. Unlike the original Quattro Valvole, which features four individual dials with four independent movements, the new 48 Four Strolkes has a single dial, which accommodates four grooves for the separate movements, all protected by a single, slightly convex sapphire crystal glass. This change was dictated not only by the aesthetic aspect it produces, but also and above all else by the attention that Meccaniche Veloci dedicates to the quality of its timepieces. The 48 Four Strokes features a 48mm titanium case, equipped with four titanium crowns, covered with a rubber lining. Its case houses four independent ETA 2671 calibre mechanical movements with automatic windings, protected by a titanium bottom plate, sealed with four screws. The dial is home to four independent movements placed inside four grooves, which are reminiscent of the valves of a four-stroke engine. The quality rubber and leather and classical titanium fold-over or deployante closure are attached directly to the case in an entirely original way.